It’s no accident of fate that #President #Vladimir #Putin’s approval rating hovers around 87 percent as opposed to #President #Obama’s which is at an all-time low of 34 percent, according to a recent Franklin and Marshall poll, while a mere 36 percent of Americans back his foreign policy. Those heady days when the #Obama received rock star welcomes in Berlin and Cairo with his message ‘Yes, we can’ have faded into distant memory. The fact is he couldn’t and he didn’t. With the world beset by crises in Iraq, Syria, Gaza and #Ukraine, the so-called Leader of the Free World took off on vacation and was pictured grinning on a golf course even as the FBI warned that ISIS posed a serious home-grown threat. As one analyst put it, his legacy will be ‘a nation in retreat’; his political foes rightly accuse him of leading from behind. #Obama has singlehandedly removed the word ‘super’ from the superpower. #Obama’s counterparts in Europe are faring little better in the approval stakes with the exception of the German Chancellor Angela Merkel; at least one, the French #President Francois Hollande, is hobbling along with a 17 percent job approval. These percentages tell us that a leader requires more than a glib turn of phrase, a Hollywood smile and a bespoke tailored suit to be effective. Charisma may help win elections but the public soon sees through the façade and demands tangible results. Neither #Putin nor Merkel can claim natural charisma; he’s cool and dour and portrays unfashionable machismo; she’s frumpy, unflappable and no-nonsense. Yet, they have won respect for doing what they say, for standing strong for what they believe. 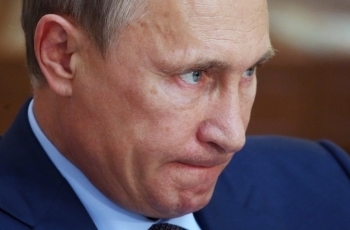 #Putin is seen as has having his allies’ back. He stands with his friends and when he takes a decision, he sticks with it whatever obstacles are strewn in his path. Those are admirable qualities in anyone, but essential in a successful leader. Just in case you imagine I’m a paid up member of the #Vladimir #Putin fan club, I should set you right. As a man, I actively dislike him. He’s managed to collect a rogue’s gallery of allies who’ve greatly benefited from his military, diplomatic and economic largesse. #Russia’s protection of the monstrous Syrian dictator, Bashar Al Assad, directly or indirectly responsible for the deaths of over 140,000 of his own people, is chilling. Humanity can never forgive Assad for his crimes, committed not only with #Putin’s approval but also Russian-made weaponry. Moreover, #Putin’s allegiance with the Islamic State of Iran that presents one of the greatest dangers to the region via its proxies and its divisive ideological dissemination igniting sectarian conflicts in Syria, Lebanon, Iraq, Yemen and Bahrain, is nothing short of contemptible. #Putin’s loyalties are misplaced. He’s guilty of prioritising national interests and a geopolitical power play over ethics and morality. That said #Obama is guilty of choosing the side of right only to let his friends down time and time again because he lacks the courage of his convictions. The US #President abandoned the Free Syrian Army; firstly by ignoring its appeals for heavy weapons and secondly, by withdrawing his stated commitment to order strikes on the Syrian regime’s military facilities. He turned a deaf ear to appeals from the Iraqi government a year ago for assistance in thwarting the threat from ISIS, which is currently gaining ground, attracting new recruits and presenting a risk to the security of western capitals. And how did he react to Israel’s slaughter of 2,100 Palestinian civilians in Gaza? He reiterated time and time again that Israel has the right to defend itself. Furthermore, the Egyptian #President, Abdel Fattah el-Sisi blamed #Obama for turning his back on the Egyptians, adding, they won’t forget that. They didn’t. Egypt and #Russia have held talks on military cooperation and have signed a US$ 2 billion arms deal. #Obama did nothing to counter Moscow’s annexation of Crimea except complain and, together with the EU, slap #Russia with sanctions which have boomeranged to shoot European economies in the foot. Amid accusations that Russian troops have ‘invaded’ eastern #Ukraine to bolster the fighting power of pro-Russian rebels, the EU is mulling imposing more hard hitting anti-Russian sanctions, but as Vauhini Vara rightly points out in the New Yorker under the heading “Hurt #Putin, Hurt Yourself” sanctions should hurt the sanctioned side more than they hurt those doing the sanctioning. The article quotes the Hungarian Prime Minister, Viktor Oran, admitting that sanctions have harmed the West more than they have hurt #Russia. While Washington and Brussels discuss what further punishments to mete out to bring #Putin into line, Moscow has banned agricultural imports from the West and wasted no time in finding eager new suppliers. And if the situation turns any nastier, #Russia could turn off gas pipelines leaving #Ukraine and parts of Europe shivering in the winter. As a side effect to this icy relationship, Moscow and Beijing have reaffirmed ties with a US$ 400 billion deal for #Russia to supply the world’s most populous nation with 1.3 trillion cubic feet of natural gas annually, expected to flow in 2018. Historically, sanctions rarely work. And given the Russian leader’s obstinacy, they won’t succeed in persuading him to alter course this time either. On the contrary, they are more likely to corner him into going for broke with a full-scale invasion of eastern #Ukraine. In recent days, #Putin has ominously highlighted the fact that #Russia is a nuclear-armed nation. By contrast, #Obama and his European counterparts look like children throwing hissy fits when a parent removes their toys. Indeed, they are worsening an already dangerous impasse by issuing personal insults, beefing up NATO forces in countries close to #Russia’s borders and accepting, in principle, Kiev’s application to join NATO, which #Putin has stated is a red line. Put simply, unless the West is willing to light a match on World War III, #Obama and friends are virtually impotent to halt #Putin in his tracks. In short, were I forced to choose between the leadership skills of #Putin, a man of his word, and #Obama, who’s all words and no action, there’s no contest. In the unlikely event, my path ever crosses with #Putin’s, I would salute to him, saying, “I may not like you as a person and I don’t approve of your policies, but you have my appreciation for being a man of your word. You’ve taken some difficult decisions that only a leader who’s confident and strong can take and for that you’ve gained my respect”. Excellent analysis and congratulations! Only great leaders and truly intelligent people who can with cold blood assess facts can admit what you wrote. It is very sad that the Society, any Society, prefers these days stupidity, superficial "look" and is afraid to dig deeper to see what person really has to say and can this person really represent nation am part of and do something. I may not agree with Putin, I may not like him for various thing he does, but I admire him and consider him as one of the best leader and politician of 21st century. He is consistent, he is intelligent, has a vision and knows what he wants and as you say his word has a value, which is rarer and rarer these days. People just use words w/o any responsibility for what they say. We all have the right to disagree, but this is why we are considered intelligent, as only intelligent person admits intelligence of the other even if one disagree. You present a well-balanced, well-argued opinion. I hadn't contemplated Putin, or Obama, in those terms before. I liked your phrasing as well.